Nail psoriasis is a very irritating condition. Psoriasis is a chronic inflammatory skin condition caused by an overproduction of skin cells. The condition not only affects the skin but may also affect the joints and nails. Read below for information about nail psoriasis. It is believed that up to 50% of people affected with the inflammatory skin condition, psoriasis will experience a degree of nail psoriasis. This is a common chronic problem that usually affects the fingernails, however the toenails may also be involved. The classical symptom of nail psoriasis is pitting of the nails. The nails may develop small holes and become severely misshapen. Nail discoloration is also a common feature, as the nails become yellowish brown in colour. As the condition worsens the nail may crumble or separate from the nail bed. This is the result of the psoriasis affecting the skin under the nail. This condition is often not only unsightly but painful. Pain may become so severe that it restricts daily activities. Nail psoriasis responds slowly to treatment. The condition is often difficult to treat, as there is no single treatment that will help everyone. It is therefore important to prevent the condition from progressing. We should all take care of our nails. This is especially so for anyone suffering from psoriasis, whether their nails are affected or not. Do not use your nails as a tool. They are not screwdrivers or scrapers. 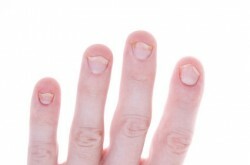 Do not clean the nails or under the nails too vigorously. Keep the nails at a sensible length to reduce the risk of trauma or injury. Avoid nail polishes containing formaldehyde or the solvent tolvene. Avoid nail polish removers containing acetone. Soak affected nails regularly and apply moisturizer afterwards. Soak thickened nails before carefully filing them with an emery board. Wear well fitting, roomy shoes to minimize pressure and friction on the nails. Nail hardeners and artificial nails will improve the look of intact nails. Nail psoriasis can be a very irritating and aggravating part of psoriasis. I hope you’ve found this nail psoriasis article useful. As always, I’d love to hear your feedback.